I sing to reinforce our rhythm. Singing is a great way to mark certain times of the day (a song for waking up) and certain activities (a song for washing hands or painting) and is especially helpful in guiding transitions from one activity to the next. Instead of saying “Circle time now!” I sing a song to call us to circle. I sing to bring reverence into our home. We sing blessings before meals and we sing a song as we light our candle for story time. We sing songs that keep us engaged with what is happening in the natural world around us throughout the seasons and songs for celebrating festivals in our yearly rhythm. I sing as a pro-active and peaceful discipline tool. Singing is a great way to soothe tantrums and upsets, and it's also a great way to keep yourself calm when your kid is spinning out of control. You can sing a song when you need to redirect a young child, to get a child's (or a group of children's) attention or to help children engage in the task at hand (a song for getting dressed). Singing also conveys the mood, whether it be boisterous active play time, or time to get sleepy for bed. I sing to create a musical rhythm for the work of our home. Singing keeps the children and I all more engaged in our work, be it raking, folding laundry, or sweeping floors, and makes it more fun. I sing to inject more fun in our simple play-filled days. I sing songs with movement suggestions, I sing while we're taking walks. We play singing games when we're outside and we have a circle time full of song. I sing to keep myself engaged in the present moment. There are times in parenting young children that my brain wants to drift off to daydreaming or brainstorming land but I want to be more present with the children. There are times when I get bored and start itching for distraction and I find myself reaching for my phone or getting on the computer. Singing helps me stay grounded and present, it's a win-win for me and the kids, and it has a better effect on my mood than checking facebook. Most of all, I sing because it's an expression of joy! Please check the Lavender's Blue Song Collection for lots of great songs to sing with your children. 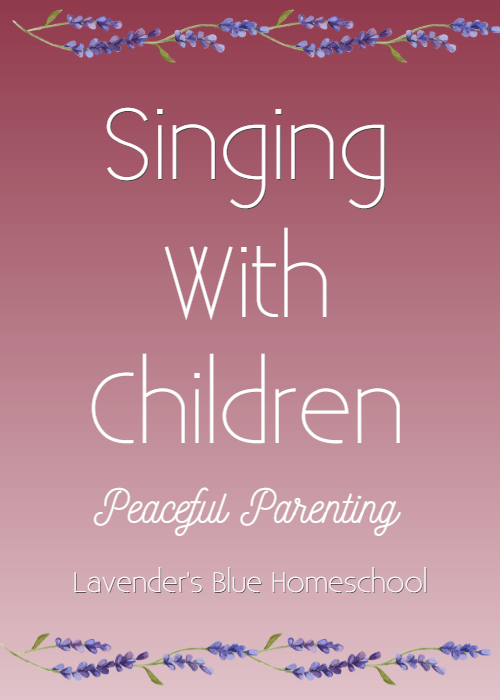 I’d also like to invite you to join the Lavender’s Blue Sing More Challenge! It’s a free 7-day challenge to help you sing more with your family. We’ll explore ways to bring more song into your days. I’ll give you my best ideas, a quick challenge each day to get you singing, and a song each day for you to download and learn. Sign up below to join in!